Bachelor in Paradise never lets you down when it comes to drama! The franchise boasts of people finding true love within weeks and, well, there are bound to be some sparks and wildfires! This time, it’s all about ex-lovers Amanda Stanton and Robby Hayes. Did Robby cheat on Amanda? Find out what happened between the two on Bachelor in Paradise 2017! Paradise saw another woman scorned and this time it was none other than return Paradiser, Amanda Stanton! She was reunited with her ex Robby Hayes, who got close to her while filming Bachelor in Paradise season 4, but they broke up soon after the show. It’s being speculated that Robby Hayes cheated on Amanda Stanton when they were trying to make it work outside of Paradise. Read on to know more about the split, and to see if Robby and Amanda are still together with this BiP finale spoilers piece! Did Robby Hayes Cheat on Amanda Stanton? Amanda Stanton was clear when she said that she and Robby weren’t a thing anymore, and their story came to an end. Fans hoped that they would rekindle their love before the BiP reunion, but that didn’t work out as planned! Amanda stated that she was “off limits” for Robby, who was friends with Josh Murray (Stanton’s ex-fiancé), and she did not want to create any more drama. 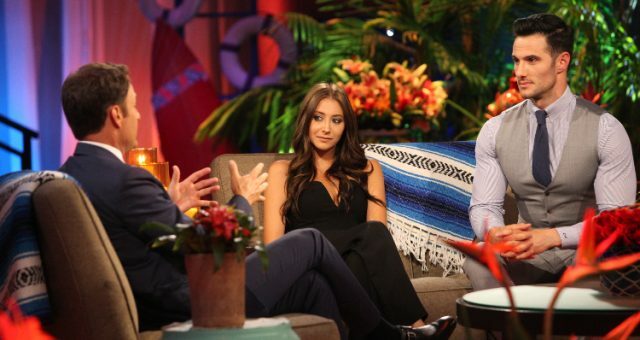 Also Read: “Bachelor in Paradise” Finale Spoilers: Are Raven and Adam Dating? In an interview, Stanton mentioned that the cheating rumors were somewhat true as she explained exactly what went down between them. “Basically what happened was there was a night where he was out in Colorado in Denver, and he was supposed to come home that night, but he had missed his flight and his phone died and I didn’t hear from him for a whole day, and then the next day he had called me in the morning and he was like, ‘Sorry, my phone died.’ And later that day, a girl said he was at a Zac Brown Band concert and sent me photos of him looking like they were making out all over each other,” she explained. But she is remaining diplomatic, saying that she can’t say much because she wasn’t there. She is now just “friendly” with Robby. Did the cheating scandal cause their break up? We can’t say for sure. But we’re sure of one thing: Amanda and Robby have split up and though it seemed amicable at first, their interaction at the reunion show last night might say otherwise. I'll never get tired of making these^^, don't hate me. ? Though the couple showed a little bit of chemistry on the show this season, it did not work out in the real world, and Amanda is now concentrating on her two children. She was married to Nick Buonfiglio before being a part of The Bachelor franchise, and they have two daughters together. Though she was skeptical about leaving her kids behind to join this season of BiP again, she was sure Nick would take care of them while she was away filming. She says she maintains a cordial relationship with her ex-husband, and though they are not together, they are co-parenting well. Up until last night, it looked like she was happy maintaining a friendly relationship with Robby Hayes following Paradise. However, things seem to have taken an ugly turn since the reunion show and the revelations that Hayes was unwilling to settle down. According to reports, Robbie Hayes was getting a little too comfortable with other women after Paradise when Robbie and Amanda agreed to try and make things work. On the BIP reunion show, Emily Ferguson called out Hayes for the photos that surfaced of him getting cozy with a girl at the Zac Brown concert. This was reportedly the last straw in making Stanton realize Hayes was not the one. “We were looking for different types of things. I think we had different expectations of what a relationship should be like. We’re not looking for the same things,” said Stanton. What Happened on the Bachelor in Paradise Finale? Robby Hayes and Amanda Stanton aren’t the only couple who went their separate ways after Paradise. With Kristina Schulman’s absence, Dean Unglert was a mess! She left the show because she couldn’t wait for Dean to make up his mind between her and Danielle Lombard. Though he shed some tears and threatened to leave Paradise to get Kristina back, Dean and Danielle stayed to the end, but their relationship didn’t last. When it came to the decision of who would go to the Fantasy Suites, things didn’t look great. Jack Stone was sure he would be able to explore the option with Christen Whitley, but she was quick to turn him down, and the two parted ways. Though Jonathan Treece and Jasmine Goode hit it off early, things dwindled quickly and they too ended up leaving Paradise separately. So, did anyone actually got to the Fantasy Suites? With Derek Peth and Taylor Nolan, Raven Gates and Adam Gottschalk, and Lacey Mark and Daniel Maguire as the final couples, each one opted to take things a little bit further. In the tell-all afterward, Kristina was teary-eyed about being vulnerable. She never let someone in as quickly as she did with Dean, and their relationship turmoil made her emotional. With Derek and Taylor being so close all season and getting even closer in the Fantasy Suite, fans were waiting for a Neil Lane ring to come out of its box. And it did! Derek proposed in the reunion special, and Taylor was quick to accept! It was a huge surprise for everyone (not to mention Nolan). Though there’s a happy ending, how long they stay together is a whole different story!